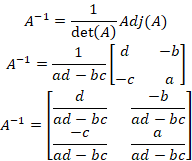 In this article, we will discuss the definition of inverse matrices that solve using elementary row operations and apply these operations simultaneously to In to get A-1. Often it will not be known in advance whether a matrix can be reversed. If the matrix cannot be reversed, then the matrix is ​​in the form of a reduced line echelon that has at least a zero number row and will appear on the left hand side. So, if the given matrix cannot be reversed, the calculation can be stopped. In connection with that, the method that will be used to perform the procedure is the Gauss-Jordan elimination method. This method will increase the superiority of its application even though the given matrix cannot be reversed. It is called having an inverse if there is a matrix B, so AB=BA=In, then A is said to be invertible. B matrix is ​​called inverse matrix A (invertible), written A-1, is a quadratic matrix with n.
Get a3 value by substituting the value of a1 previously obtained in equation 1 or 2. Get a4 value by substituting the value of a2 previously obtained in equation 3 or 4. From the above calculations obtained a1 = 3/2, a2 ​​= -1/2, a3 = -2, and a4 = 1. Finding the value of Adj(A) from matrix A with the first step is to find the value of Cofactor Cij. 0 Response to "Definitions of Inverse Matrices and Proof of Inverse Matrix Formulas"